This helmet comes with 4 x FREE additional outer lenses (2 x Clear, 2 x Amber) Helmet Bag & ESAB branded bandana 0700000821. The best welder's deserve the best equipment. When it comes to choosing a helmet, Sentinel is it - with ergonomic headgear, supreme comfort, intuitive controls and crystal-clear visibility. Streamlined shell design: Not too big, not too small accounting for a range of different head sizes and shaking up the aesthetics at the same time. The flush exterior also minimises extrusions, so nothing catches when working in tight spaces. Ergonomic HALO headgear: The Sentinel five-point headgear is adjustable, so the weight of the helmet can be shifted around the head, which reduces pressure loads and increases comfort for the long-term wear. Spherical front cover lens: The sweeping design across the Sentinel helmet allows for more natural light to get in when welders are in grind mode, ultimately increasing visibility and clarity. 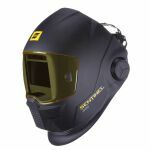 The Sentinel welding helmet also comes with 2 x lenses; A clear lens and an amber lens, each of which are quickly and easily replaceable in a matter of seconds. Hypervisible LCD control panel: Sentinel features a full-colour LCD touchscreen panel, similar to a smartphone's screen. The premium display will increase clarity for welders and its intuitive controls and easy-to-use functions make clever technology simple. High-performance auto-darkening filter (ADF): Sentinel redefines visibility for the welder with it's high optical class ADF, allowing for a brighter view and enhanced colour definition. The light state grind mode provides superior convenience and can be accessed from an external button. Solar cell + 2 replaceable lithium batteries. Alerts when low battery.